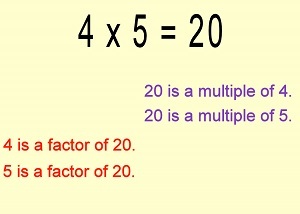 Product, multiple and factor are terms that are related to multiplication and division. It is important to understand what these Math terms mean. When we multiply 2 numbers, the answer is called the product. The question "Find the product of 4 and 5" means "Find the answer to 4 x 5". The product is also called a multiple of each of the 2 numbers that gives that product. 4 x 5 = 20. Therefore, 20 is a multiple of 4. And 20 is also a multiple of 5. Therefore, 18 is a multiple of 3. And 18 is also a multiple of 6.
multiples of the Times Tables. 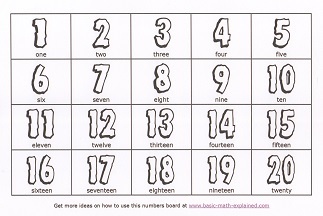 Here is a Times Tables chart for your child to fill in. Print out as many copies as you need. The question "Is 35 a multiple of 7?" means "Is 35 one of the answers in the 7 times table?" or "Can 7 be multiplied by any number to get the answer 35?" 20 is the fourth multiple of 5. 20 is the fifth multiple of 4. The question "What is the sixth multiple of 8?" means "What is the product of 6 and 8?" After your child has learned his Times Tables, play this family game everyday for more practice. Print and cut out the numbers from this 1-100 Numbers Chart. Place the numbers in the middle of the table. Call out a number. Everyone must rush to pick out only multiples of that number. For example, if you call out "8", everyone must pick out only multiples of 8: 8, 16, 24...and so on. Or you can call out "Third multiple of 6". The person who picks out 18 gets the point. We can compare the multiples of 2 or more numbers and see which multiple occurs in both numbers. Let's find some multiples of 3 and 5. 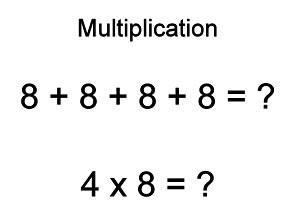 The common multiples of 3 and 5 are 15, 30 and so on. 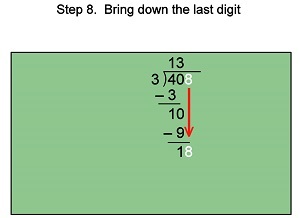 The Lowest Common Multiple (or LCM) is 15. It is the first multiple that occurs in both numbers. A factor is the reverse of a multiple and product. Factors tell us about divisibility. If 4 is a factor of 32, it means that 32 can be divided by 4 without leaving a remainder. We say that 4 and 5 are factors of 20 because 20 can be divided by 4 and 5 (without leaving any remainders). The question "Is 3 a factor of 20?" means "Can 20 be divided by 3?" If the answer is Yes, then 3 is a factor of 20. If the answer is No, then 3 is not a factor of 20. Once we know the Times Tables, we can also know the multiples and factors of numbers. The factors of 20 are 1, 2, 4, 5, 10 and 20. We can compare the factors of 2 or more numbers to see which factors occur in both numbers. Let's find some common factors in 12 and 20. The smallest multiple of a number is the number itself. The other multiples are all bigger than the number. The biggest factor of a number is the number itself. The other factors are all smaller than the number.